Donald Trump’s political historical has been full of controversy. From pushing the Obama Birth certificate conspiracy to essentially claiming that undocumented immigrants from Mexico were rapists (or large;y so), Donald Trump has really stirred a hornet’s nest. A number of anti-Donald Trump sites rankings from giving people the option of punching or pooping on Donald Trump have arisen (in fact, 54% of Americans apparently want to punch him). On the other hand, he is apparently popular enough for a cottage industry of apparel (including ugly Christmas sweaters) to be built around him. Who is the man behind all of the controversy? Here we’ll take a deep dive on Donald Trump. You probably have wondered just how many years of experience this radical conservative presidential candidate could have in life and business? Well, the 69 year old born on June 14, 1969 will turn 70 this year, by the time of the general election. This would make ‘The Donald’ the oldest U.S. president at the time of election. Ronald Reagan is currently the president who was the oldest when he left office at 69 in 1980. What is Donald Trump’s education? Donald Trump attended the Kew-Forest School where his father was a member of the board of trustees. He left there after some behavioral deviations to enroll in the New York Military Academy before entering higher education. Trump went on to attend Fordham University in the Bronx for 2 years. He went on to enter the Wharton School of Business at the University of Pennsylvania where one of the few programs in the country for real estate studies was available. He proceeded to graduate with a degree in Economics in 1968. Is Donald Trump a Veteran? Donald Trumps has been quoted as claiming he was fortunate to have a high military draft number in the selective service lottery. Trump had four student deferments prior to his graduation in 1968. After being deemed medically fit for service in 1966, he also had a medical deferment in 1968 which he has stated were for heel spurs in either 1 or both feet. So Trump never served in the military by enlisting nor draft. How did Donald Trump begin his career in business? Trump’s father, Fred Trump owned the successful investment real estate enterprise, Elizabeth Trump & Son, while Trump was growing up. This business focused on middle – class rental housing in the New York boroughs of Queens, Staten Island, and the Bronx. After Donald Trump had a failed attempt at co-producing show business, by backing the 1970 Broadway comedy ‘Paris Is Out,’ he focused on progressing his father’s business which he began working as an undergraduate. After a successful redevelopment project on a foreclosed apartment complex, which he later sold with significant profit, Trump moved to Manhattan in 1971. He became involved in larger housing projects. He gained recognition for using progressive architectural design. In 1973, he came to higher public recognition when he was accused by the justice department of violating the Fair Housing Act. He continued his real estate investment with some major projects involving revitalizing and re-purposing some outdated or bankrupt properties around New York and Pennsylvania including transportation hubs and rail yards. Eventually he took advantage of a tax abatement to redevelop a historical hotel next to Grand Central into a lavish hotel while creating the Trump Organization. From the 80’s through the early 90’s, Trump was active in investment with some success and failure. He overcame bankruptcy by restructuring debt and and re-negotiating the terms of some partnerships in high profile hotels and even a small airline. This is the period of his career where he ventured into Atlantic City. Trump was able to recover to a financially viable position by the late 90’s. And this is also when his father’s extremely valuable estate was divided among he and his three surviving siblings. How can Donald Trump finance his own campaign? By the turn of the 21st century, Trump had a small empire of namesake hotels and luxury businesses. Though he did face additional bankruptcy situations, Trump has stated his income in this more recent period was well over $300 million before interest, dividends, capital gains, rental income, and royalties. Although, Trump received tax rebates on several years that are for couples earning less than $500,000 per year. His campaign manager has suggested these rebates were an error. 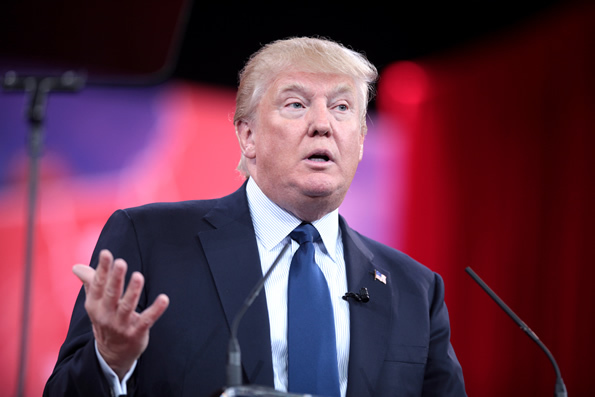 Trump’s name has gained enough notoriety in the luxury real estate industry that Donald Trump licenses the use of the Trump name to other owner / operators. While Donald Trump has certainly set some precedent for campaign funding he has received some support form individual donors which federal law caps at $2,700 per candidate per election. About $13 million of the $19.4 million his campaign brought in by the end of 2015 came from his own reserves. And it it true that billionaires are not “buying” him. Large contributors have mostly refrained from supporting his campaign. Of the small percentage of funding that has come from larger single contributions, Trump does not appear to have solicited it with high profile fund – raising tactics. He has put up much more of his own money that any other candidates in most elections in U.S. history. What is Donald’s religious background? Trump is affiliated with the Presbyterian denomination. He claims he is Christian, and that he believes in God. He has stated that the bible is “thee book.” And he has expressed that he believes in God. It is not just the podium, the suit or the stage that make Donald look big. He’s a hearty 6’2″. Donald lives with his wife Melania on the top 3 floors of the Trump Tower in Manhattan, where they enjoy majestic views of the city and Central Park from their deluxe penthouse. How many kids does Donald Trump have? Donald Trump Jr. His eldest son who was born during his marriage to 1st wife, Ivana, is 37 and is reputed to have closely emulated the career path of his father. Ivanka Trump Donald’s 1st daughter also with Ivana, is 34. She has been extraordinarily successful in her right. She enjoyed a long career as a model that led to becoming a New York Times best selling author, before becoming Executive Vice President of acquisitions and development for her father’s company. She also marketed her own brand of Ivanka Trump clothing. Eric Trump Donald and Ivana’s 2nd son is now 31. He serves as Executive Vice President of his father’s management company. And he has been active with Donald on the campaign trail. Tiffany Trump Donald and 2nd wife, Marla Maple’s 22 year old daughter, Tiffany is the only child of Donald not raised in New York, but in Las Angeles with her mother. She is known as a socialite and has recorded a single in the music industry. She has been present at political events and debates with her step siblings. Barron Trump Donald’s son with his wife Melania is 9. He attends elementary school and is active in sports. What sports does Donald like? Donald has stated that he dreamed of playing in the majors when he was 17. He was active in team sports in school including football, soccer and baseball, and is reputed to have been a great player. Two MLB teams allegedly had scouted Donald. And a fellow teammate remembers him as one of the craziest ball players ever. He went on to buy the New Jersey Generals in 1983 which he has since sold. Why won’t Donald Trump touch alcohol? Trump’s brother Fred died of an alcohol related condition at the age of 42. This made an impression on Trump that has shaped his consumption habits. He is known to have never smoked cigarettes, drank, or used recreational drugs. How can Donald Trump already be a president? Donald is the President of the Trump Organization. Donald Trump is an avid golfer. What does The Donald like to drive? Trump owns a few high end machines. He has long been a fan of the English Rolls – Royce which has been known to describe its horsepower as “adequate.” He also owns a Lamborghini Diablo. And his auto collection also sports a Mercedes – Benz SLR McLaren. How DOES Donald achieve that hairdo? Trump claims to have created his look with his own, natural hair by blow drying it forward and then gently combing it back. How has Donald contributed the home gaming industry? Donald marketed his own game. In 1989, Trump: The Game hit store shelve as a monopoly styled board game. Where can you find Donald in Hollywood? A ready hand shake would seem to be an indispensable gesture for a politician. But Donald is a germaphobe. He dislikes the gesture. However when he is led to participate in a shake, he is known to pull the other party toward him with a vigorous and strong hand shake. Donald has stated that all of the females on The Apprentice have flirted with him — consciously or unconsciously — and that this is to be expected. How old is Bernie Sanders?